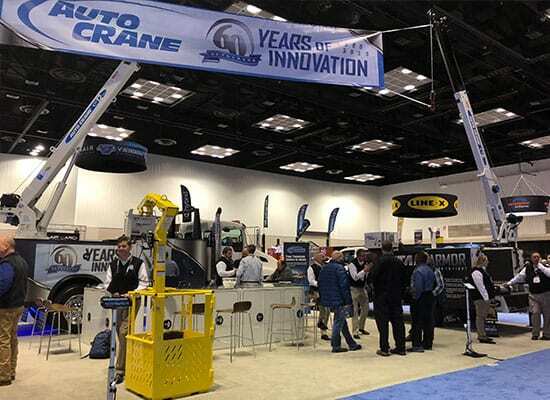 Auto Crane continues its tradition of cutting edge innovation and excellence at NTEA 2019 in Indianapolis, Indiana. The NTEA Work Truck show is amping up for several new products to be introduced and displayed with over 100 companies already announcing that new trucks and equipment will be at the show. Auto Crane is no exception as we will be continuing our tradition of industry innovation and excellence with our new 2019 products and services. In the past, Auto Crane has used the NTEA Work Truck show as the launching pad venue for rolling out break-through innovations such as the NexStar Crane Management System, the NexStar Connect, and the unbreakable Titan Armor — all Auto Crane exclusives. “We are excited to continue to bring innovation to the Work Truck Show as we begin another year of excellence for our dealers, distributors and partners,” said Todd Hannum, Director of Sales for Auto Crane. Auto Crane will be at booth #3119 with its sister companies Eskridge and Ramsey Winch. The NTEA Work Truck Show is March 5-8th, 2019 in Indianapolis, Indiana. Headquartered in Tulsa, OK, Ramsey Industries is comprised of three wholly owned subsidiaries that include Auto Crane, Ramsey Winch and Eskridge. Auto Crane designs and manufactures a comprehensive line of truck-mounted electric and hydraulic cranes, crane service bodies, crane control technologies, accessories, and mobile solutions for the energy, mining, construction, industrial, forestry and railroad industries. Eskridge is a leading designer, manufacturer and marketer of planetary gear drives and anchor drives, digger drives, and multiple-disc brakes. Ramsey Winch designs and manufactures industry-leading industrial and consumer winches for use in towing and recovery, industrial, petroleum, off-road and ATV vehicles. For more information, visit us at www.autocrane.com, www.eskridgeinc.com and www.ramseywinch.com.